All of the guests arriving at our marina office, then taken to there boats, which will be waiting in the harbour The captain will get permission from the port (harbour Master) to leave the harbour. 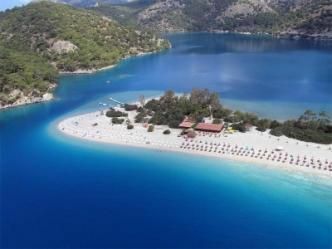 Then your blue cruise starts to Ölüdeniz. Guests wishing to do paragliding their have this opportunity to do in Ölüdeniz. After lunch and a swimming break, we set of again to Gemiler ( St. Nicholas Island ). Guests who wish to visit the ruins of this historical Island, St. Nicholas Island, there is a small fee to enter. You have the opportunity to do water sports. Then dinner and overnight stop will be here at Gemiler Island. Breakfast in the morning then of to Fırnaz Bay. 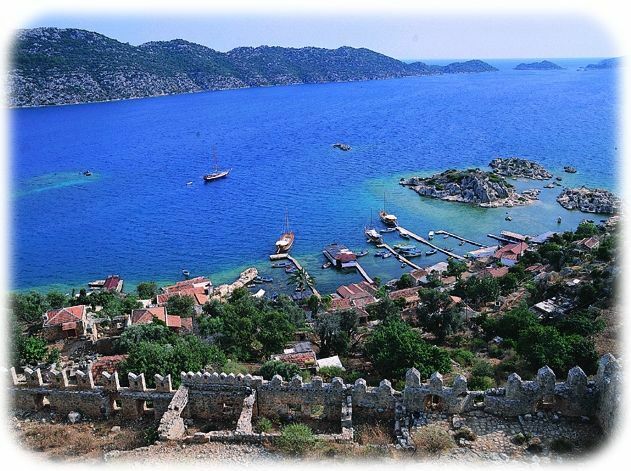 After swimming and a break, of we go to Kaş. Our guests will have short-time to stroll around in this lovely place. having a drink in one of the cafe's or shopping. After a short while, we head of again for dinner and overnight stop to Iç Sıcak Bay. 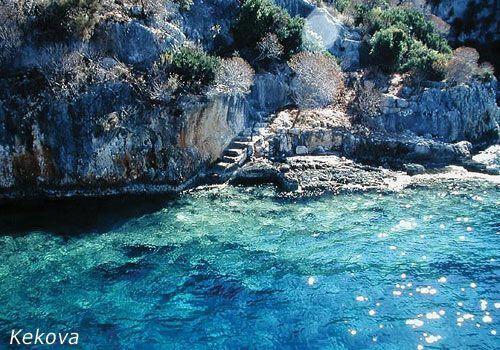 After our breakfast the new route is to Kekova, where the Lycian ruins are located under the sea. It is forbidden to anchor in these areas where the ruins are because its passing just across from the ancient Simena Village, we will anchor next to Simena. After lunch you can visit the ancient Simena Castle here. 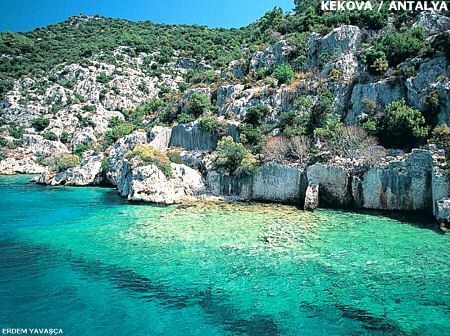 Then next route is the beautiful bay of Gökkaya, by seeing on the road the Korsan ( Pirate) cave. We have motorized water sports in this area and the opportunity to just enjoy the sea and sun too. 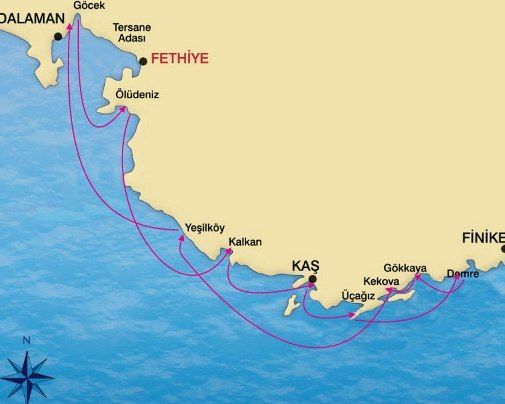 Dinner and overnight stay will be here in Gökkaya Bay. After breakfast and a swim our boat will leave for your last stop at Çayağzı (Andriake) harbour. These tours are provided with free transfer for all of our guests. 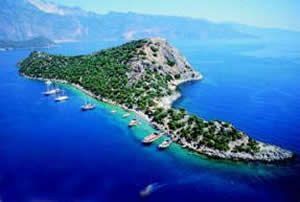 Our transfer only applies to Olympos, Fethiye and Demre centers. 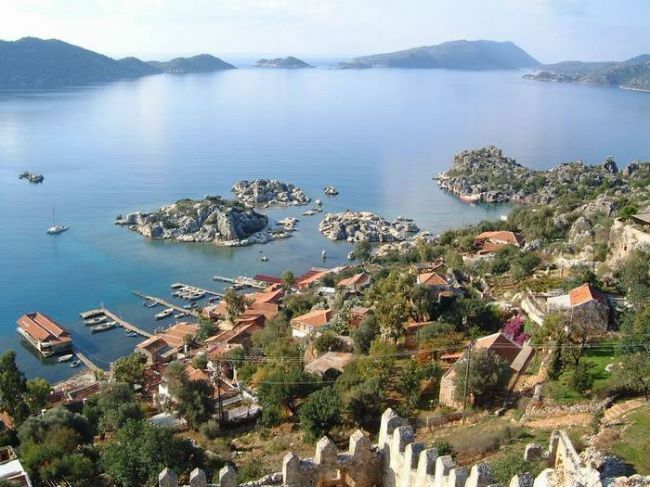 The transfer are not provided to the surrounding region such as Çalış, Ölüdeniz, Hisarönü, Çıralı Beach and Antalya. ▪ Prices above are in EURO and are for one person in a double cabin on a Full Board basis. Sharing.